This image is the end product of an entire evening working with a common funnel web weaver spider in her terrarium. 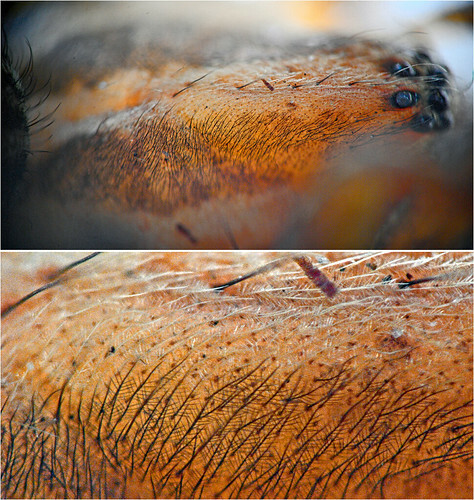 The intent was to get as clear an image as possible of the tiny "feathers" that these and a variety of other spiders have in certain ares of their body, especially on the cephalothorax. The top image was taken looking down into the terrarium with the cover removed and the end of the lens peeking through a ragged hole (made by a pencil), in her sheet web. She was positioned in a way that allowed the "feathery" area behind her eyes to be nearly parallel with the camera back, to allow for the very limited depth of field produced by the unusual macro rig used to get the shot. The bottom panel is a tight crop of the top image, cleaned up as much as possible to reveal detail in the structure of the "feathers". Working with this spider was a bit frustrating as she really seemed disturbed by the lens or reflectors occasionally making slight contact with either her web, or the stick it was anchored to. Eventually I got her to settle down by dropping a Petco flightless fruit fly in front of her. After a quick lunge and grab, she seemed more interested in her meal than what was going on around her. another Nikon BR3 ring > Nikon T-Mount adapter > Nikon 20X lens. Mounted above the lens is a small high intensity LED light that's fastened with rubber bands to a mount made from a plastic lens filter "wrench". This serves as a focus assist light to allow easier framing and focusing with the exceedingly dim viewfinder image. I'll post a pic of the rig in the near future. It really is totally impractical for field work, but produces decent results in a controlled environment.